Hey, do you guys remember that poster for 2.8 that was released before the game was out? You know, the one that also had its artwork featured on a 2.8 insert in Final Fantasy XV? Well, I've got a question about that. The mantle behind everyone here that they're standing on, the one with the keyblades and the large eye at the top, always intrigued me. It first appeared in the E3 2015 trailer, where Xehanort looks to the keyblade on the mantle, which is the one he will later inherit, and I was wondering if anyone has seen it in 2.8 so far. As far as I can tell, it was not present anywhere in Back Cover, nor was it featured in 0.2 Birth by Sleep. Do you think this was simply a decorative item Luxu's line of apprentices had later, or do you think it'll have a great deal of importance for the final title of the series? One of the only things I can think of, as to why it would be in this, is to hint at a somewhat higher role the goatblade might play in KH3 (however bad that might sound). That could be it, it's just... why that mantle? 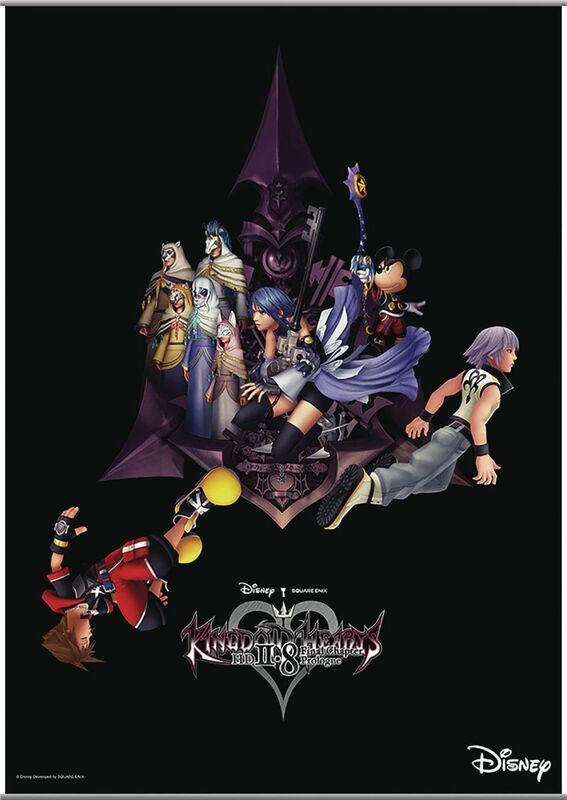 Why not some sort of dark portal in the background with the keyblade or something, or where nothing gathers in the background? It just seems odd to me, maybe the mantle is supposed to illustrate the keyblade war? There's a lux symbol on it or something. Because having a portal wouldn't have been as ornate at the plaque on which the Keyblade rests. It's got some heavy symbolism of inheritance and the single thing that connects all those games is that Keyblade's legacy. Well, for one thing, it probably looks a lot cooler than the goatblade floating in the background or something like that would. That said, there are a lot of elements that make me think of the chi era, so that could be part of it as well. Or both, since the two are tied pretty closely. Aside from the goatblade looking stupid in the background thing, I do feel like it has some sort of deeper meaning. It just seems odd that, for something so symbolic and apparently unifying throughout these games, it has yet to appear in anything, not even in the collection whose poster it was featured on.